Where the BMA Tower (One Park Place) stands today, on a hill at 31st and Southwest Trafficway, Catholic nuns once ran a home for orphans. The St. Joseph Orphan Girls’ Home operated from 1880 until 1960, one of several charitable institutions in Kansas City that cared for homeless and impoverished children. A home for orphans that took in hundreds of children between 1880 and 1960 was a well-known part of the Midtown landscape. The St. Joseph Orphan Girls’ home took up the entire block between Southwest Trafficway (then called Summit) and Pennsylvania north of 31st Street (Karnes). 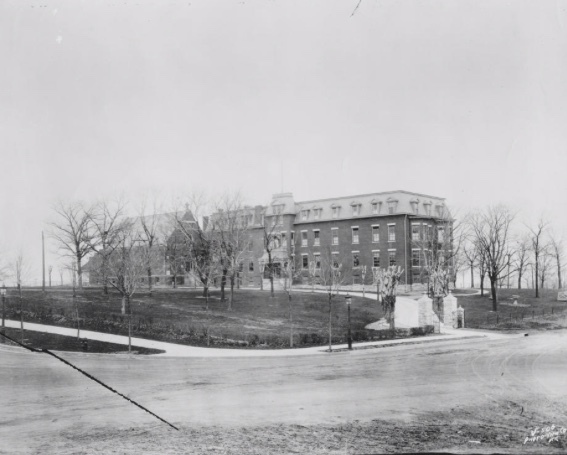 Although it was called the Orphan Girls’ Home, the institution did more than house children without parents. It also provided for young people when their parents were temporarily or permanently unable to care for them. 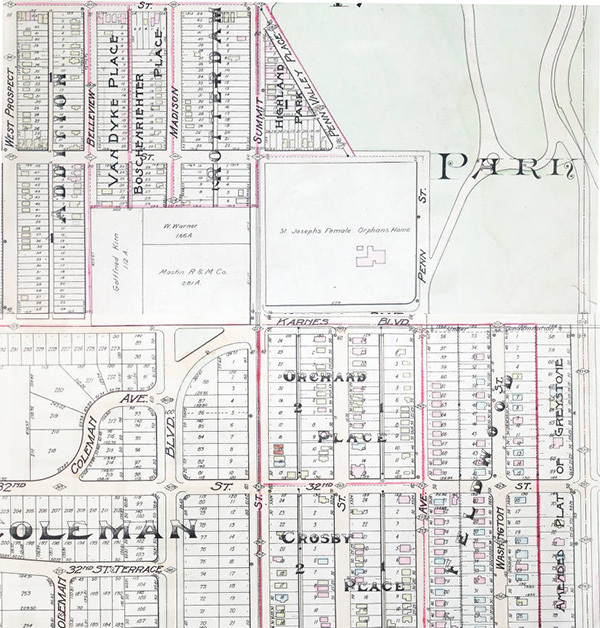 A 1907 Tuttle & Pike map shows the orphanage. For example, Helen Shrzelewakis, who as an infant came to Kansas City with her Polish immigrant parents, spent several years at the home around 1950. After the family arrived in Kansas City, her father’s health deteriorated, a result of the strain of living in a refuge camp. He was forced to enter an institution and could no longer provide for Helen. Her mother was lucky enough to be offered training as a nurses’ aid at St. Joseph Hospital, but her work schedule made it impossible for her to care for Helen. She turned to the nuns at St. Joseph’s, and Sister Winifred immediately took Helen in. The sister had said the home was open to any child whose physical or moral life was in danger. As part of our Uncovering History Project, the Midtown KC Post is taking a look at each block in Midtown, including a set of 1940 tax assessment photos which is available for many blocks. (Many people seem confused by the tax assessment photos, which all include a man holding a sign. Here’s the story behind them). Today, the block between Southwest Trafficway (then called Summit) and Pennsylvania north of 31st Street (Karnes). The home was supported by the community through the United Funds Agency and the Catholic Diocese. Many of the girls there were orphans awaiting a home, but there were others like Helen, whose families needed temporary help. Mothers were able to visit on Sundays and often took the girls to visit other family members. Younger girls attended classes at St. Joseph’s while older ones went to Redemptorist High School. The orphanage traced its roots back to Rev. Bernard Donnelly, pioneer Kansas City priest, who cared for orphans of Civil War in his own home. The need was great enough to warrant opening the home for girls in 1880. (Another orphanage, the Orphan Boys Home, operated on the current site of the Westport Shopping Center). St. Joseph’s housed 28 girls the year it opened. A chapel was added in 1895, and additions on the north and east were also built in the early 1900s. 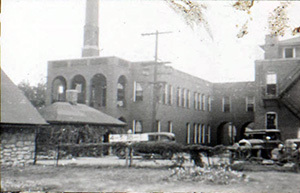 The high school was started in 1940. The home in a 1940 tax photo. There were 140 children, aged 5 to 14, living at the home in 1921 when a fire broke out at 10 in the morning. Joseph Fitzgerald of 3103 Pennsylvania was across the street when the fire began. He rushed into the classrooms to warn the sisters, who then ordered the girls to line up and marched them out to the lawn. “The sisters led the children from the burning building to a corner of the big yard. The children clung to the hands of their rescuers, sobbing and crying, as they glanced back at their home and classroom, a seething furnace of flame and smoke. Speaking in comforting tones the nuns began to tell stories” helping the girls feel more at ease, according to a newspaper story that day. Hundreds of people lined the streets to watch the roaring fire and the firemen struggling to carry hoses to the building. As the nuns stood praying, the firemen removed sacred objects from the chapel and rear of the building. Of course, nothing so minor as their home burning up could stop the nuns from the day’s lesson plans. They soon led the girls to a nearby yard where they continued their studies. It was later determined that tinners working on the roof had ignited the fire. Even as the fire still smoldered, the local community began donating to rebuild the orphanage. By 1958, only 58 girls were residing in the home. Two years later, the Catholic Diocese decided to close the orphanage and move the girls elsewhere. The bishop said it was no longer needed because of changes in child care methods, the expanding foster home program, and the work off the Catholic Charities office and social workers. 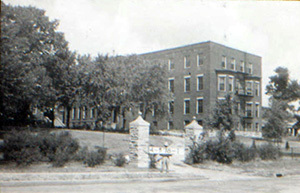 Additional buildings on the grounds of St. Joseph Orphan Girls’ Home in 1940. In 1960, the diocese sold the property to Business Men’s Assurance Company of America, which razed the orphanage and built the BMA Towner (now called One Park Place). Had no idea that was there. I use to work for the Postsl Service nearby. Very interesting. Thank you. Love Kansas City History. Keep up the good work.